Everyone uses plates and bowls in their homes but do you know decorated plates can be pretty show pieces as well? You can decorate your plates and bowls with several designs and decorative items. These decorative plates make great gifts. You can gift them to your friends and family members. Here are some items you will need to decorate and paint your plates. You can follow the under mentioned steps to create some personalized dishes with funny drawings, funny quotes, inspirational quotes etc. You can use these plates as party favors or birthday presents. Firstly, it is important to choose the right plate. You must choose a glass plate that’s microwave friendly. A glass plate won’t melt in the oven and this is of utmost importance for this project. 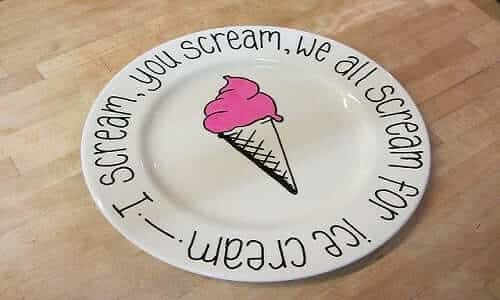 Now you can decorate your plate using different sharpies. You can draw funny pictures or write love messages on your plate. The quote or drawing depends on the person for whom you are making a personalized plate. For instance you can simply write “Will you marry me?” on your plate if you want to propose your girlfriend. Once you have decorated your plates with sharpies, you can bake them at 350 degrees for about 30 minutes. That will help you set the ink. Afterwards, let your plate cool down completely.
. This spray will not only allow you to decorate your plate well but it will also allow you to use it for serving food. You can purchase a Krylon acrylic crystal clear coating 11 oz bottle. This spray protects your drawings and decoration from water, dust and stains. It provides a permanent gloss coating to your plate. This spray is moisture resistant and smudge-proof. You can also use it on your old photographs to improve their contrast. You can use this spray to protect your carbon copies, records, maps, documents, display materials, ceramic items, wood crafts and many more items.
. These bags come in various sizes and shapes. You can check out the Candy Cane and Cross cellophane bags from Century Novelty. These bags will help you finish your project with grace. They allow you to give decorative plates to your loved ones in style!